1) When did you start to smoke Cigar ? I started smoking cigars on December 16,1998. 2) Why did you start to smoke Cigar? In 1998, one of my cousins, before leaving Cuba for the United States, asked me what I would like to have from the homeland, since I had never visited since I left in 1985. So I replied, a Cuban cigar. Have no idea why, but it just came out. And blessed were those words, because ever since, it has become a way of life for me. 3) How many Cigars do you smoke during the day? I usually smoke 1-2 cigars per day. It all depends on my daily schedule, and day of the week. On weekends, I may have up to 3. 4) which is the best place you have smoke a Cigar ? The best place where I have smoked a cigar would definately have been in August, 2012 during a avisit to Cuba. I am originally from Sandino, Pinar del Rio, and visiting my birth province was always in my head. On a Saturday afternoon, I had just finished eating a late lunch at “El Palenque”, in the Vinales valley, and then proceeded to sit on the grass just underneath the mural of the pre-history, in the same area. I lit a Montecristo, A Lo Cubano, no cutter and no lighter. I simply bit off the cap and used two carton match sticks, just being in direct contact with my Cuban nature, in such a peaceful place, meant the world to me. 5) What do you use to cut the Cigar ? To cut my cigars I use a guillotine or a punch, depending. When in Cuba, it is a must to just bit the cap off. Don’t know why. 6) How do you feel while you are smoking ? When I smoke a cigar, several things come to my mind. I usually think of the relaxion properties, the art and elegance, the differen flavors, the people around the world that smoke them, and the fact that it is my favourite hobby. Cigar smoking has helped me in sevralrough situations, in my personal sphere. As a psychiatric nurse, I encounter on a daily basis with the therapeutic effetcts on a chemical called, lithyum carbonate. It is a largely used anti-depressant, and it is mostly found in the Cuban soil. To me that’s the reason attributed by me to convey those relaxing states of mind and body. I do not get this effect as much, when I smoke a non-Cuban cigar. After smoking a cigar, and totally feeling delighted with the different aromas of wood and honey, I feel energized and ready to conquer my surroundings. 7) When do you ligth your first Cigar of the day? I usually light my first cigar in the mid-afternoon, right after lunch. I like to smoke when I will have plenty of time to enjoy. Of course it alla depends on the size of my cigar. My favourite for this time would have to be a Behike 54. 8) What is the Cigar for you? For me a cigar is a continuation of Cuba in me. I left my country in 1985, and that has been a constant heartache, every day of my life. I consume on small to high doses, three well known products of my beautiful island , they would be rum Santiago de Cuba, cigars and coffee. All of three in that respective order. I do not feel more Cuban than any other Cuban, but am extremely proud to tell people from all walks of life, that I come from the land of coffee, tobaco and rum. I am extremely honored to be called, “A Cigar Lady”. I am very glad to edit this interview. I hope many people read these words, because reflect Cuban people, Cuban culture, Cuban style, Cuban pride. Thank you very much Mildrey. Buen humo. 11 Responses to "“Mildrey Galindo„"
I really enjoyed reading my interview, and am extremely grateful to you, Massimo. Thank you. you are welcome Mildrey…thank you. I find this interview very wonderful and that Midrey’s passion for cigars is awesome. 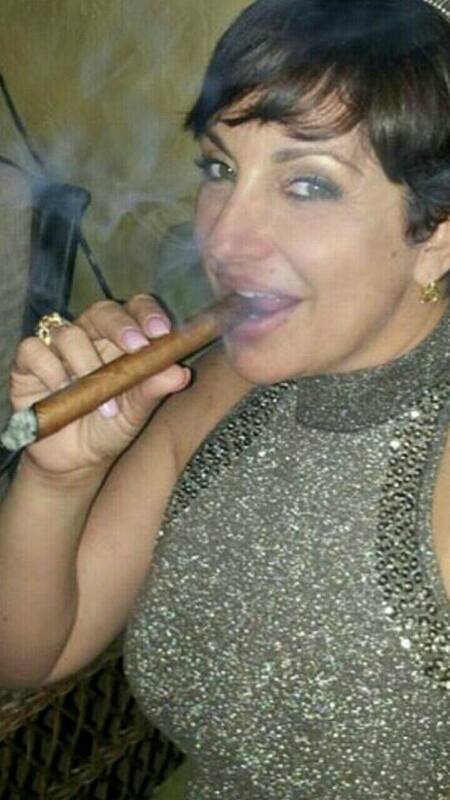 Hermosa, interesante, con mucha personalidad, te llamare de ahora en adelante A Cigar Lady. As LOLAS’ Ambassador for S.Fla. WE FEEL VERY PROUD OF OUR AFICIONADOS, and as such, Mildrey Galindo, Congratulation for this regonition. Well done LOLA !!!!! Here Here!! In representing LOLA “Ladies of the Leaf” and Cigar Lady. I am very proud to see Beautiful and talented women whom have had the courage to be proud for their heritage and stand strong in being powerful acts of success in this world by giving back much Love, Peace, Encouragement and Beauty from the heart. Thank you. You are a role model. blessings and loving Ashes your way…:). Thank you all for your comments. I simply enjoy a God given gift, that provides me with great pleasure, “a cuban cigar”. God bless you. Proud of this recognition my fellow LOLA! It is great to see how proud you are of your heritage, your passion for Cigars and LIFE! Congratulations on this recognition and all your accomplishments.